Invercote G is designed for graphical products and prestige packaging where an exceptional aesthetic result is desired. 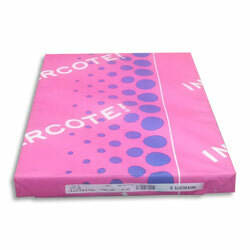 Invercotes unique characteristics and structure make it ideal for the packaging of luxury products printed with dry toner digital presses. It is also perfect for greeting card and postcard production. Invercote G has a smooth surface that is tailored to meet the need to faithfully reproduce the most sophisticated printed images and the high demands of flawless foil and film lamination. This surface, combined with Invercote Gs excellent structural, design and embossing characteristics make it ideal for the packaging of luxury products. Invercote G is recommended for high-end packaging and also for aroma and flavour sensitive products. It is particularly suited for the packaging of perfumes, cosmetics, chocolates, pharmaceuticals, wines and spirits, as well as for brochures, book covers, cards, menus, advertising material and CD covers. The printing side is triple coated and has a matt finish. Thanks to its composition of solid bleached (SBS) primary fibres, Invercote G has a superior strength and toughness compared to board grades that contain mechanical or recycled fibres, or single-ply bleached primary fibre board. This strength gives several advantages in carton designing and processing, in packaging operations and in the use of the package itself. A patented coating formula provides outstanding lightfastness, giving the end products a longer life. The whiteness level is tailored to ensure the best print contrast and colour reproduction. In addition to traditional printing techniques such as offset and screen printing, Invercote G works well in most digital colour copiers and digital printing presses on the market today. The reverse side is surface-sized and suitable for less demanding print requirements. FSC. ISO 9001. ISO 14001. ECF.